Description: Three New World scenes, including an early view of New York City (New Amsterdam) as a small hamlet. Description: Revolutionary War. Hudson River. 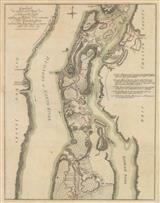 Shows Fort Washington and its environs. Description: Elegant map from Stedman's 'History of the American War' showing the manoeuvres of American and British Forces on Newark Island. Description: Entrance to Hudson's River from Sandy Hook to New York. Sea chart with depths and sailing instructions. 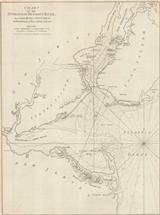 Description: New York, Long Island, Staten Island and New Jersey. Original colour. Description: New York City. Attractive city plan. Coloured. Description: Southern part of Manhattan, New York City, divided into wards with annotations for churches, public buildings and hotels. Printed colour. Description: Manhattan city plan with key showing the election districts. Original colour. Description: New York City, Brooklyn, Hoboken and Jersey City. Detailed street plan with an inset map of Manhattan and Harlem. Original colour. 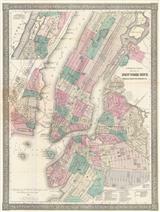 Title: : Plan of New York &c.
Description: Striking map of New York City with its iconic hippodamain street plan. Also showing parts of Hoboken and Brooklyn and surrounded by elaborate border. Original colour. Description: Early map of Manhattan, Jersey City, Brooklyn and Williamsburg with decorative vignettes of Broadway and City Hall. Coloured. Description: New York, Manhattan, Jersey, Hoboken and Brooklyn. Two maps on one sheet from "Valentine's Manual of the Corporation of the City of New York". Original colour. Description: Plan of New York City centring on Manhattan but also showing the development of Brooklyn together with Jersey City and Hoboken. 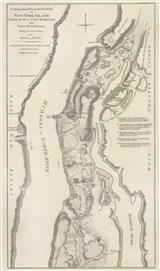 An inset shows the development of North Manhattan. Printed colour. Description: Large folding map of the planed improvements to the street layout of the Upper Westside, inscribed by Towle to Manton Marble. 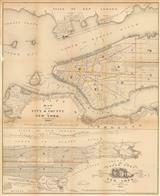 Description: Plan of New York City also showing the development of Brooklyn, Jersey City and Hoboken. Printed colour. 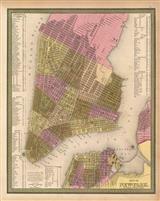 Title: : Topographical Atlas of the City of New York including the Annexed Territory, Showing original water courses and made land.